When one thinks of a water tank, they might not necessarily be thinking of something that’s glamorous. In fact, across the country, many water tanks are often left in poor condition. The original coating system crumbled under constant exposure to UV radiation, moisture, salt and other elemental deterrents, leaving behind a surface that is chalked and faded, a clear indicator of coatings failure. Despite the fact that this is a sad reality that many water tanks face, there are ways to restore, improve and reserve the exterior surface of a water tank. Take, for example, Tnemec’s Hydroflon, a coating that has been fortified with FEVE resin. The Lumiflon FEVE resin technology employed by Hydroflon extends the lifespan of a coatings system exponentially. Hydronflon was featured on the winners of Tnemec’s Tank Of The Year Contest for the past two years. If you look at the designs and the location of each tank, it’s quite obvious as to way such a system was chosen. 2017’s Tank of the Year was the Ann Arbor Tank of Ann Arbor, Michigan. 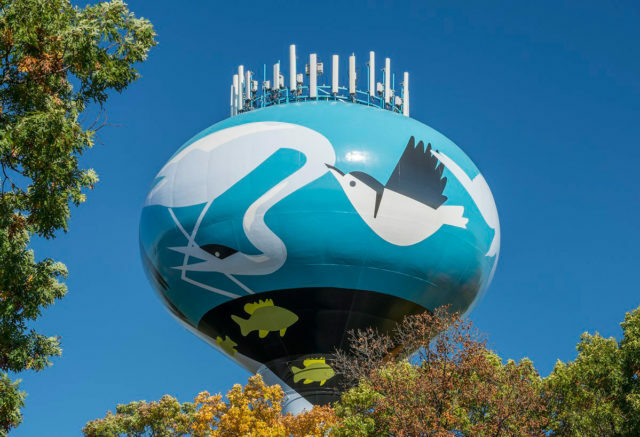 The tank is coated with a gorgeous sky blue and is embellished with colorful birds that hail from Michigan. 2018’s winner was an equally-stunning beach-themed tank from Destin, Florida. 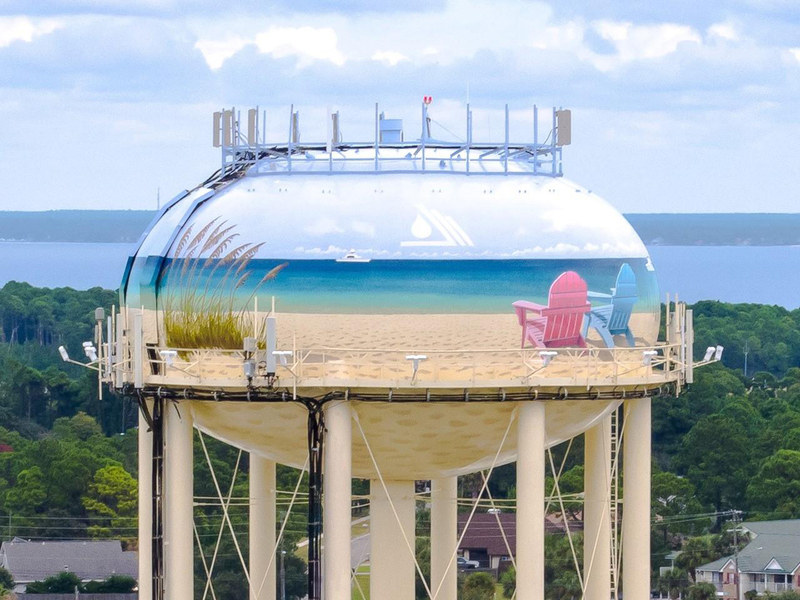 The tank depicts a typical day in the life of a Destin resident, lounging in some beach chairs and enjoying a sunny day at the beach. The fact that these two tanks are so complex, and are located in a spot—out in the open, underneath the sun and exposed to the elements—where the coatings systems are constantly put to the test is what makes the usage of FEVE-based paints crucial. FEVE coatings are hyperdurable, offer paralleled color and gloss retention, low VOC, and can be applied in the field, which is important when applying the coating onto the tank. Looking at Lumiflon’s impressive portfolio of water tanks, it’s rather easy to notice the array of colorful and creative water tanks and, given the results of each beautiful tank, it’s no surprise that coatings with Lumiflon are quite popular among water tanks.